REMISSION, a short film by director John Charter and artist Paul Kaiser, uses stunning visuals to explore the effects of PTSD on trauma survivors and their families. Through the use of visuals and art, it shows the internal struggles of a war-trauma survivor as he tries to reconnect with his daughter. The film’s combination of animation, creature costumes and live action is immediately striking and gives it a very surreal and expressionistic tone. The unique approach to the story is innovative and also allows the audience to connect with the story in a really visceral way, making it a moving experience. Both the animated and live-action sequences have a lot of spatial awareness, which helps give the film a lot of flow that adds to the dream-y quality of the piece. The cinematography by Rainer Lipski is exceptional and really highlights Kaiser’s gorgeous artwork and the setting. Shot in Southern California, including Death Valley and Sequoia, the setting is used to highlight both the artwork and the overall tone of the film. From dark caves to a harsh desert to lush forests, the film feels expansive and allows the viewer to take in the symbols and metaphors to connect with the material. These simple, natural landscapes also allow Kaiser’s artwork to take centre stage and be the focus of the film. And they should be because they’re so outstanding and the most impressive part of the film. Grim yet colourful, futuristic and natural, the creature designs are both gorgeous and unsettling. Against the natural backdrop, they feel both out of the world and part of it. The curiosity that these costumes inspire makes it hard to take your eyes off the film. Kaiser’s experience as a US Navy veteran, his struggles with PTSD and his estranged relationship with his children served as inspiration for the story. He uses his art to work through his experiences and as a way to connect with his children. While the art and story is personal to Kaiser, it also gives the film and story a universal accessibility that it might not have had if it was told as a narrative. It allows the viewers to appreciate and understand Kaiser’s experiences, and it also allows them to find their own meaning and experience in the creatures. The fairy tale structure adds to the accessibility because it grounds Kaiser’s emotional experiences within a familiar framework. 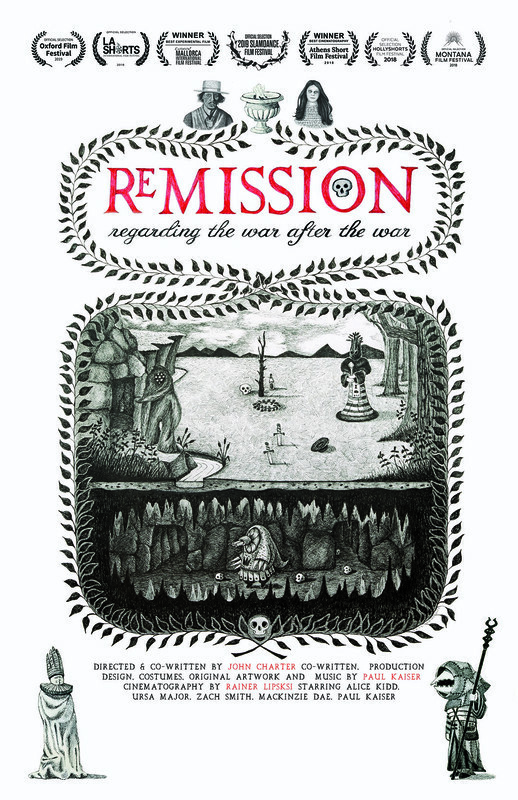 REMISSION is a very personal tale and Charter tells it beautifully. Even the editing, lighting, score and sound effects work to highlight Kaiser’s art and story - it’s clearly working to emphasize a singular vision and the film succeeds in creating an entire world. It’s clear that a lot of time and care went into this short film. The moving backstory adds to the importance of the piece as well. The best examples of art are the ones that have a lot of personal meaning behind them and REMISSION is no exception. It’s able to be both an outstanding film and a moving story about one man’s personal struggles. And the meaning behind it is what makes it all the more impactful.